WE LEAVE NOTHING TO READ. YOU LEAVE NOTHING TO CHANCE. 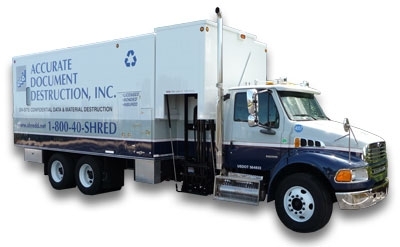 Accurate Document Destruction is a wholly-owned subsidiary of Groot Industries and the largest mobile shredding company in the Chicagoland area. Our shredding services offer small to large corporations the most secure means of Document and Product Destruction available. Our large fleet of trucks enables us to take on any size job. Whether you require on-site or off-site shredding, regularly or on an as needed basis, it is our #1 goal to ensure your clients' protection as well as your own.